For a candidate who owes her name recognition to a friendly media, Wendy Davis is having trouble not riling up the local press. Dave Mann of the Texas Observer writes that the extent to which her team is botching media relations is “the worst … I’ve ever seen,” an embarrassment weakening her candidacy. Mann initially admits that he is not a media relations specialist, but has covered a large number of political campaigns. Davis’s, he says, holds the record for absolute worst, and it threatens to sink her entire campaign. Attributing the follies to inexperienced, young media flacks, Mann nonetheless finds some of the behind the scenes errors inexcusable. Among the Davis media team’s “Greatest Hits” are sending reporters to the wrong venue for a press event, inviting them to a media event closed to the press, and “refusing to confirm basic campaign scheduling details” out of media suspicion. While the initial mistakes were “funny,” Mann writes, the staffers are significantly damaging Davis’s ability to spread her message–even interrupting Davis once before she could answer a question at a press event, rendering the candidate unable to deliver a statement. Only one outlet was allowed to cover the event: the Dallas Morning News. The Davis camp provided reporters at the event with a live stream link. “This is not unlike someone sending you an invitation that says you’re not invited to a party, but, hey, you can watch it on Skype,” Mann writes. Ultimately, he concludes that the bigger issue for the campaign is not the threat of angering reporters, but the fact that limiting and unnecessarily causing friction in the relationship with the media means Wendy Davis will reach fewer voters than desired. This is what happens to a campaign without an ideological core–liberal or conservative. Upon being attacked for embellishing her life story, Davis immediately attacked her opponent (who had nothing to do with the Dallas Morning News story unmasking her), the reporter who dug up her backstory (a well-known liberal writer), and, running out of ideas, Rush Limbaugh. Abbott, her campaign insisted, had not “walked a day in my shoes.” (Abbott is a paraplegic.) Instead of correcting her story and putting the scandal behind her, she sent out a press release asserting, “Damn right” her certifiably untrue story “is a true story.” Her daughters praised her modesty. When reports surfaced that Democrats didn’t trust her because she was once a registered Republican who donated to George W. Bush, she bizarrely replied that not being trusted was “a compliment” because “I am not driven by” ideology. Then, in another attempt at distraction, Davis suddenly claimed to be in favor of gun rights despite her “F” rating from the NRA. The pro-gun push resulted in a lamentable photo of Davis holding former Governor Ann Richards’ rifle at an event where no media were allowed. Had there been media, maybe a professional would have taken a better photo. The kitchen sink approach is doing Davis no favors, and now we hear from Texas journalists that the operation looks even more in tatters from up close. It leaves voters confused, media inclined to be sympathetic outraged, and the Republican Party of Texas laughing all the way to Austin. 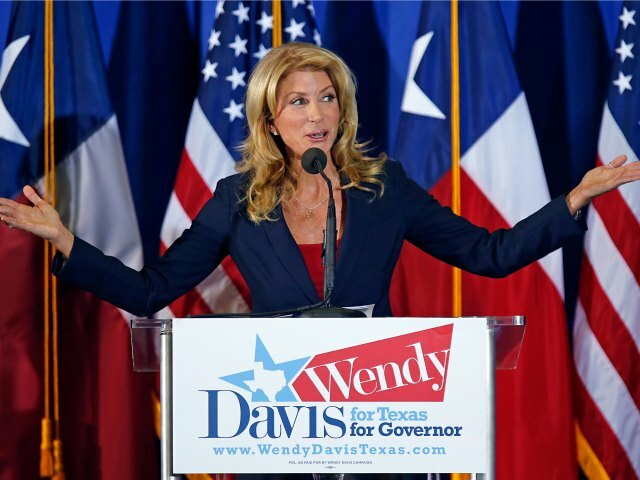 When an entire candidacy is built around the candidate’s thirst for power, things like “policy ideas” and “a PR strategy” fall by the wayside, and few campaigns make that point as clearly as the unraveling mess that is Wendy Davis’s.